Hand Crafted Multi-gemstone Beaded Necklace, "Green Essence"
This beaded necklace in radiant hues of green and blue is a unique addition to any outfit. Somluck Komolmith of Thailand uses cylindrical beads of reconstituted turquoise to form the necklace, while octagonal pieces of reconstituted turquoise and round beads of lapis lazuli and pyrite form a dainty design. This necklace features a spring ring clasp and extender chain for adjustable length. 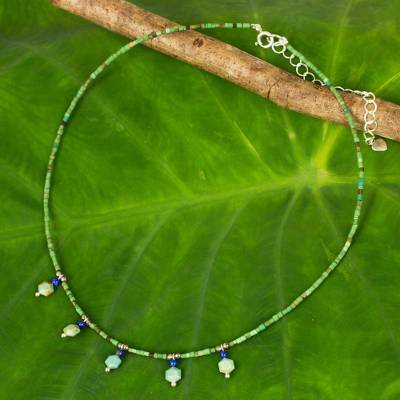 You can find multi-gemstone beaded necklace 'Green Essence' by Somluck Komolmith in jewelry categories such as Gemstone Necklaces, Birthstone Necklaces, Lapis Lazuli Necklaces, Pyrite Necklaces, Turquoise Necklaces, Reconstituted Turquoise Necklaces, Multigem Necklaces, Silver Necklaces, Sterling Silver Necklaces and Beaded Necklaces. Enjoy exploring these sections for other Novica treasures. I am very happy with my new stone and glass necklace. The colors of the stones are very vibrant. I also like the adjustable clasp. I would definitely buy a product from this vendor again.